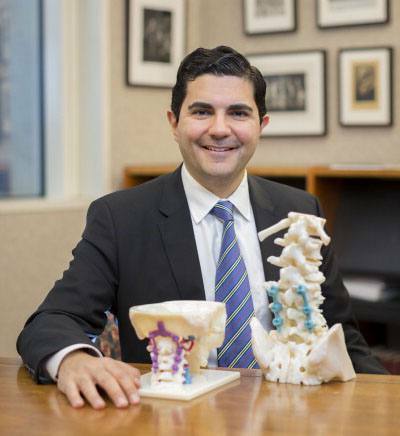 Mohamad Bydon,M.D., with 3-D models of the spine and neck. Most people suffer from some type of back pain during their lifetime. That’s because there are many joints in the back that can degenerate over time. In many cases, back pain can be relieved without surgery. Ice packs, heat packs, physical therapy or injections can offer relief. However, for those who suffer from degenerative disk disease, in which the tissue in a disk in the lower back breaks down, there are few treatment options. These patients may suffer chronic, debilitating pain that can impact quality of life. According to Mohamad Bydon, M.D., the genetic signatures which underpin the disease remain unclassified, especially for young patients who develop the condition. That’s why Mayo Clinic Center for Individualized Medicine is supporting research to identify molecular changes associated with the condition, with the hopes of finding new individualized therapies. “Young patients can develop degenerative disk disease. As a multidisciplinary team, we are examining whether certain genetic events predispose patients to this condition,” says Dr. Bydon, a Mayo Clinic neurosurgeon and a member of the research team exploring individualized therapies for degenerative disk disease. Is there a genetic signature that is causing disks in the spine to deteriorate early in life? Do patients without the disease have some type of protective biological characteristic that prevents disk deterioration that those with degenerative disk disease don’t have? Can new therapies be developed to target genetic factors and molecular processes causing the disease to slow down or reverse disk damage? According to Dr. Bydon, this research could be especially important for patients for whom corrective surgery doesn’t work or isn’t a good choice. “Many older patients have other complex health conditions, making them poor candidates for surgical treatment. Targeted therapies would offer these older patients a new, safer option for treatment and could help reduce their pain and improve their quality of life,” says Dr. Bydon. "Support from the Center for Individualized Medicine has allowed us to bring together clinicians and researchers from across Mayo Clinic to help patients with degenerative disk disease find relief from their painful symptoms and return to their daily activities. This collaboration to solve unmet patient needs is what sets Mayo apart." – Mohamad Bydon, M.D. Dr. Bydon is collaborating with a multidisciplinary team that includes neurosurgeons, orthopedic surgeons, physiatrists, biomedical engineers, geneticists, genetic counselors and bioinformatics experts. Joining Dr. Bydon in this research effort are Mayo researchers Andre van Wijnen, Ph.D., A. Noelle Larson, M.D., Ahmad Nassr, M.D., and Wenchun Qu, M.D., M.S., Ph.D.